This section contains information related to Condor, flight code 3L, a low-cost carrier original type. "Intersky aims to connect the Rhine Valley region and the area around the Lake of Constance with important business and tourist destinations. 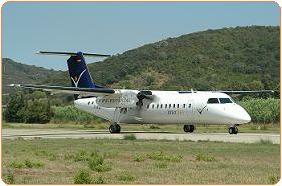 Their fleet consists of modern Dash 8-300 aircraft with which they fly tourists and business travelers cheaply." Intersky is a privately owned. Click to browse to the network development section of this site, featuring more more information on the network development of InterSky.